Destruction of the Southwestern Front. Nearly the entire Southwestern Front of the Red Army was encircled. However, the Kiev encirclement was not complete, and small groups of Red Army troops managed to escape the cauldron days after the German pincers met east of the city, including the headquarters of Marshal Semyon Budyonny, Marshal Semyon Timoshenko and Commissar Nikita Khrushchev. The commander of the Southwestern Front—Mikhail Kirponos—was trapped behind enemy lines and killed while trying to break through. The disaster of the battle was an unprecedented defeat for the Red Army, exceeding even the Minsk tragedy of June–July 1941. The encirclement trapped 452,700 soldiers, 2,642 guns and mortars and 64 tanks, of which scarcely 15,000 escaped from the encirclement by 2 October. Overall, the Southwestern Front suffered 700,544 casualties, including 616,304 killed, captured, or missing during the month-long Battle for Kiev. As a result, five Soviet field armies (5th, 37th, 26th, 21st, and the 38th), consisting of 43 divisions, virtually ceased to exist. The 40th Army was badly affected as well. Like the Western Front before it, the Southwestern Front had to be recreated almost from scratch. After the rapid progress of Army Group Centre through the central sector of the Eastern front, a huge salient developed around its junction with Army Group South by late July 1941. A substantial Soviet force, nearly the entire Southwestern Front, positioned in and around Kiev was located in the salient. While lacking mobility and armor due to high losses in tanks at the Battle of Uman,they nonetheless posed a significant threat to the German advance and were the largest single concentration of Soviet troops on the Eastern Front at that time. On 3 August, Hitler temporarily cancelled the drive on Moscow in favor of driving south and attacking Kiev in Ukraine. However, on 12 August 1941, Supplement to Directive No. 34 was issued, and it represented a compromise between Hitler, who was convinced the correct strategy was to clear the salient occupied by Soviet forces on right flank of Army Group Center in the vicinity of Kiev before resuming the drive to Moscow, and Halder, Bock and Guderian, who advocated an advance on Moscow as soon as possible. The compromise required 2nd and 3rd Panzer Groups of Army Group Centre, which were redeploying in order to aid Army Group North and Army Group South respectively, be returned to Army Group Centre, together with the 4th Panzer Group of Army Group North, once their objectives were achieved. Then the three Panzer Groups, under the control of Army Group Center, will lead the advance on Moscow. Initially, Halder, chief of staff of the OKH, and Bock, commander of Army Group Center, were satisfied by the compromise, but soon their optimism faded as the operational realities of the plan proved too challenging. On 18 August, OKH submitted a strategic survey (Denkschrift) to Hitler regarding the continuation of operations in the East. The paper made the case for the drive to Moscow, arguing once again that Army Groups North and South were strong enough to accomplish their objectives without any assistance from Army Group Center. Pointing out that there was only enough time left before winter to conduct a single decisive operation against Moscow. On 23 August, Halder convened with Bock and Guderian in Borisov (in Belorussia), and afterwards flew with Guderian to Hitler's headquarters in East Prussia. During a meeting between Guderian and Hitler, with neither Halder nor Brauchitsch present, Hitler allowed Guderian to make the case for driving on to Moscow, and then rejected his argument. Hitler claimed his decision to secure the northern and southern sectors of western Soviet Union were "tasks which stripped the Moscow problem of much of its significance" and was "not a new proposition, but a fact I have clearly and unequivocally stated since the beginning of the operation." Hitler also argued that the situation was even more critical because the opportunity to encircle the Soviet forces in the salient was "an unexpected opportunity, and a reprieve from past failures to trap the Soviet armies in the south." Hitler also declared, "the objections that time will be lost and the offensive on Moscow might be undertaken too late, or that the armoured units might no longer be technically able to fulfill their mission, are not valid." 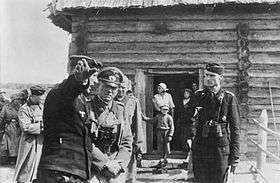 Hitler reiterated that once the flanks of Army Group Center were cleared, especially the salient in the south, then he would allow the army to resume its drive on Moscow; an offensive, he concluded, which "must not fail.". In point of fact Hitler had already issued the orders for the shift of Guderian's panzer group to the south. Guderian returned to his panzer group and began the southern thrust in an effort to encircle the Soviet forces in the salient. The bulk of 2nd Panzer Group and the 2nd Army were detached from Army Group Centre and sent south. Its mission was to encircle the Southwestern Front, commanded by Budyonny, in conjunction with 1st Panzer Group of Army Group South under Kleist, which was driving up from a southeasternly direction. The Panzer armies made rapid progress. On 12 September, Kleist's 1st Panzer Group, which had by now turned north and crossed the Dnieper river, emerged from its bridgeheads at Cherkassy and Kremenchug. Continuing north, it cut across the rear of Budyonny's Southwestern Front. On 16 September, it made contact with Guderian's 2nd Panzer Group advancing south, at the town of Lokhvitsa, 120 miles behind Kiev. Budyonny was now trapped and soon relieved by Stalin's order of 13 September. After that, the fate of the encircled Soviet armies was sealed. With no mobile forces or supreme commander left, there was no possibility to effect a break out. The infantry of the German 17th Army and 6th Army of Army Group South soon arrived, along with 2nd Army (also on loan from Army Group Center and marching behind Guderian's tanks). They systematically began to reduce the pocket assisted by the two Panzer armies. The encircled Soviet armies at Kiev did not give up easily. A savage battle in which the Soviets were bombarded by artillery, tanks and aircraft had to be fought before the pocket was overcome. By 19 September, Kiev had fallen, but the encirclement battle continued. After 10 days of heavy fighting, the last remnants of troops east of Kiev surrendered on 26 September. The Germans claimed 600,000 Red Army soldiers captured, although these claims have included a large number of civilians suspected of evading capture. 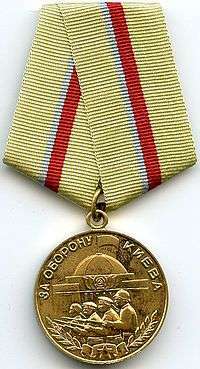 107,540 Soviet personnel were awarded the medal for the defence of Kiev from 21 June 1941. Immediately after World War II ended, prominent German commanders argued that had operations at Kiev been delayed and had Operation Typhoon been launched in September rather than October, the Wehrmacht would have reached and captured Moscow before the onset of winter. Heinz Guderian and Fedor von Bock in particular fiercely argued that the "diversion" to Kiev would have dire consequences if the operation dragged on for too long. Winter was coming in a few weeks, and if Moscow was not taken before the first snow, the entire operation would be bogged down in the mud, as it was historically. However, David Glantz argued that had Operation Typhoon been launched in September, it would have met greater resistance due to Soviet forces not having been weakened by their offensives east of Smolensk. The offensive would have also been launched with an extended right flank. Glantz also claims that regardless of the final position of German Troops when winter came, they would have still faced a counteroffensive by the 10 reserve armies raised by the Soviets toward the end of the year, who would also be better equipped by the vast industrial resources in the area of Kiev. Glantz asserts that had Kiev not been taken before the Battle of Moscow, the entire operation would have ended in a disaster for the Germans. 1 2 Glantz 1995, p. 293. 1 2 Krivosheev 1997, p. 260. ↑ Read 2005, p. 731. ↑ Krivosheev 1997, p. 114. ↑ Erickson 1975, p. n/a. ↑ Glantz 2011, pp. 54-55. 1 2 Clark 1965, p. 130. ↑ Clark 1965, p. 101. ↑ Glantz 2011, p. 55. 1 2 Glantz 2011, p. 56. ↑ Glantz 2011, p. 57. ↑ Glantz 2011, p. 60. 1 2 3 4 Glantz 2011, p. 58. 1 2 Glantz 2011, p. 59. ↑ Guderian 1952, p. 200. ↑ Guderian 1952, pp. 202. ↑ Clark 1965, p. 111,139. ↑ Clark 1965, p. 133. ↑ Clark 1965, p. 135,141. 1 2 3 Glantz 2001, p. 23.